A parking is available for travelers. It is located just outside the terminal. It has 200 spaces where are also parked rental cars and tourist bus. Parking fee is 15 Dalasi per day. 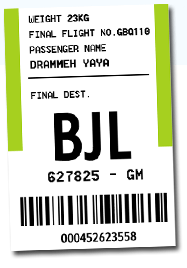 Taxis are available at all scheduled flight arrivals in Banjul International Airport. They are recognizable by their yellow striped green color. They do not have a meter, but the main destinations have a fixed rate indicated outside the terminal. Any ride outside the destinations indicated must be negotiated with the driver before entering the vehicle. Prices are then free. However count between 200 and 300 Dalasi (much more expensive if you pay in a foreign currency) for a drive between the airport and the tourist areas of Bakau, Kololi or Kotu. Count between 400 and 500 Dalasi to go to Banjul. Shuttle buses and minibuses arranged by hotels circulate to all coastal areas of The Gambia. If you stay in a hotel in this area, ask them if a shuttle can drive you there. Several car rental companies offer their services in The Gambia. Some of them have an office in Banjul airport and others provide you with the car on your arrival. Hertz has a kiosk at the airport (tel: +220/9903919).